A randomised, double blind, placebo-controlled pilot trial studying the effects of Lactobacillus reuteri ATCC 55730 on the incidence of diarrhoea in hospitalised adults treated with different antibiotics. The patients ingested either Lactobacillus reuteri 2×10^8 CFU (one tablet twice daily, n=13) or an identical placebo (n=10) for 4 weeks. Pneumonia, abscess, chronic obstructive pulmonary disease and bronchitis were the most common diagnoses that required antibiotic treatment. Stool frequency, consistency and gastrointestinal symptoms were monitored during the 4 weeks and for a further 2 weeks after the supplementation was stopped. 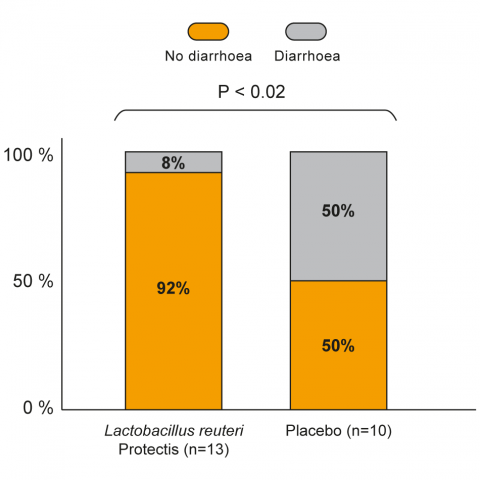 Conclusion: The intake of Lactobacillus reuteri significantly decreased the incidence of antibiotic-associated diarrhoea in hospitalised adults, and Lactobacillus reuteri was well tolerated. Cimperman L, Bayless G, Best K, Diligente A, Mordarski B, Oster M, Smith M, Vatakis F, Wiese D, Steiber A, Katz J. A randomised, double-blind, placebo-controlled pilot study of Lactobacillus reuteri for the prevention of antibiotic-associated diarrhoea in hospitalised adults. J Clin Gastroenterol. 2011;45(9):785-9.